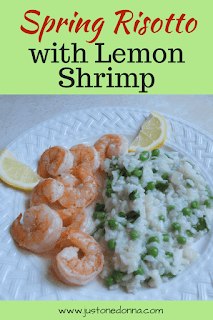 Do you love risotto and shrimp? Risotto is a side dish I make often in spring because so many spring vegetables are a perfect addition to risotto. This Spring Risotto with baby spinach and peas is just right paired with Lemon Shrimp. It's quick and easy, too! Risotto is such a versatile dish, but the constant stirring can sometimes feel inconvenient. Today I'm sharing an alternate technique for easy risotto. You'll have this entire meal ready in less than thirty minutes. That makes it a yummy weeknight menu option for spring. To me, risotto is a comfort food that is perfect any time of year. It's made with Arborio rice which is a short grain, high starch rice. The high starch content is important to produce the yummy, creamy consistency we all love in risotto. This technique differs from traditional risotto preparation by adding all of the chicken broth at one time. You'll stir just twice during the remaining cooking time which frees you for other tasks in your meal preparation. It's important to use a heavy pot when preparing your risotto this way. An enamel-coated, cast iron pan works best. Your finished risotto may not be quite as creamy as it would have been had you stood over it, stirring constantly, but this technique is a welcome alternative for busy weeknight meal preparation. Give it a try and see what you think. Heat one tablespoon of olive oil in a heavy cast iron enameled pot with a tight-fitting cover, over medium heat. Add the diced onion and saute until the onion is tender, about three minutes. Add the Arborio rice. Stir to coat the rice with the oil and cook about one minute. You'll see the pearly white interior of the rice kernels. Add the wine and cook until the wine has been absorbed by the rice. Meanwhile, heat the chicken broth. Add the broth, all at once to the pot. Stir to distribute. Bring the liquid to a boil, cover the pot with the lid, reduce the heat to simmer, and set the timer for twenty minutes. Come back and stir the rice twice during the next fifteen minutes. Prepare the shrimp. Remove the shells and season with salt and pepper to taste. 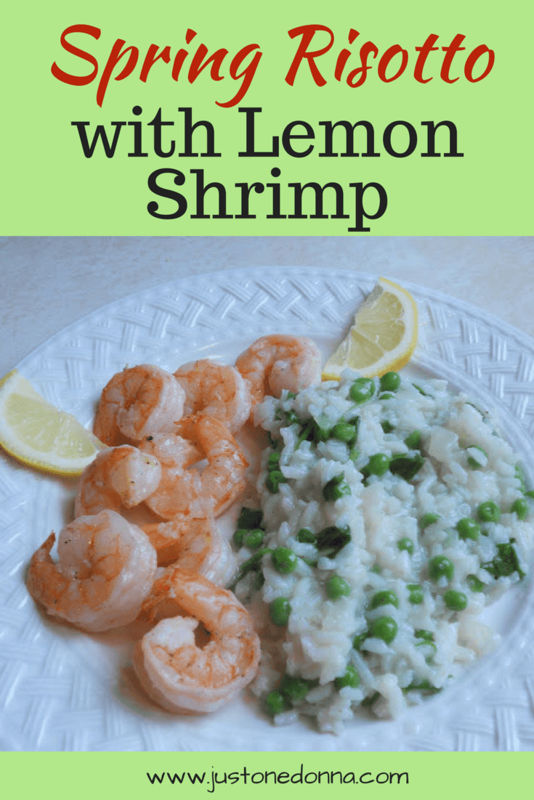 Toss the shrimp with 1/2 teaspoon of lemon zest. When there are about ten minutes left for the rice to cook, heat one tablespoon of olive oil in a large frying pan over medium heat. Add the shrimp. Cook for approximately three minutes. Squeeze the juice from half of the lemon over the shrimp. Turn the shrimp to complete the cooking. Remove the shrimp from the heat when they are pink, about 5-7 minutes of total cooking time. Now, focus on the risotto. After the risotto has been cooking for twenty minutes, add the spinach, all at once. Stir the spinach into the rice. Add the peas and the remaining 1/2 teaspoon of grated lemon zest. Stir in the Parmesan cheese. Taste. Add salt and pepper as needed. Plate the risotto and shrimp. Garnish with lemon slices. Serve and enjoy. Can you make risotto without standing over the pot, stirring constantly for twenty minutes, or so? Yes, indeed. The key is to use a heavy pot like the enameled cast iron pot I used. Thank you for sharing this post on Facebook, Pinterest, Twitter, and Yummly!